Description: Apart of the new order of dash-9s CSX had creeps out of Manchester. Description: Q283, the old ML-433, clambers out of the cut in Washington. Description: Due to trackwork on the River Sub. Q271 had to detour via the NYS&W and NS via Binghamton. Description: Here the Q271 is passing through Franklin, NJ and in a couple of minutes the crew will be changed and a road crew put on. Description: The detour Q271 pounds across Edison Rd in Ogdenburg, NJ with dynamic breaks screaming. Description: Here CSX 5103 leads detour train Q271 westbound on a cloudy September afternoon. Title: Dark Future at Sunset! Description: NB Trash Train W/ 3 Units, 3rd units a Road Slug. Description: Q116 takes the controlled siding in Palmer with CSX 5103 and 5122 on the point. Description: Out of Avon Yard, west of Indy. Description: 643 on the left, 726 on the right. 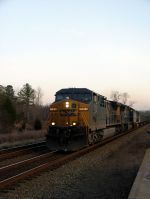 Description: CSX about to depart eastbound. Title: I Missed MOAY For This?!?!? !